Hello world. I know you have been waiting for another photo and I've got the goods. We're doing well. Nothing much to report. We've got an appointment with the doctor on Saturday. There might even be a little ultrasound picture in it for you, if the baby will sit still enough to get a clear shot. The name search continues. Since discovering the provincial lists of names, we have all but abandoned several of the ones that were top ten names. Karla's new favourite for boys is Atticus. I support the idea behind it, from Atticus Finch in To Kill a Mockingbird, but I don't like the sound of it. I think it would make a good middle name. I still like Conan. Even more since I started to think about all the cute little nicknames that the names inspires, such as Conan the veterinarian, Conan the humanitarian, or Conan the centenarian. Our vacation plans for Egypt are progressing. We have booked a flight and will spend the week there with Martine. Her boyfriend, Willy, who is a farrier (he makes horseshoes), can't get time off work. We're planning on spending a few days in Cairo, then cruising the Nile from Aswan to Luxor to see some of the ruins in Upper Egypt, like Karnak and the Valleys of the Kings and Queens. The car is back and is freshly painted. It's a relief to have it again. I went to have it checked again. It took a few minutes since all of the inspectors took the first 15 minutes of work to go pray. When they got back though, they all set to work: one stamping the papers, one inspecting the cars and the third reading a magazine. Eventually I was processed through and they licensed it for the year. Posted by Jamie Hide at 1:39 a.m.
No photo this week. But Karla continues to do well. She can feel the baby's movements regularly now. School is back in full swing now. I gave my first test this week and Karla's got lots of marking to do. She always had lots to do last year in grade 5. She might have to slow down a little since grade 8 produce quite a bit more than itty-bitty grade 5's do. Tutoring has picked up. I've got 7 or 8 hours a week (two kids I taught last year (the good ones, thankfully) and one new guy I see today for the first time). And on Tuesday I went out to tutor and came home to find Karla sitting at our dining room table with a grade nine student. Karla talked to the mom and told her that she would only tutor if the kid came to our place. The mom said they would talk about it and called back to say that they would like to come over right away. That's right "they". Both mother and daughter came over. Mom sat in our living room and chatted on her mobile phone during the lesson. I guess you never know what wickedness we might be imparting to children under the guise of parts of speech and algebra. We were back at salsa and rueda class last night. Still no do-si-does, so it's not that much like square dancing. Tonight, we're going to games night at Josh and Tamara's place. It's a busy weekend! Josh is planning on running in the Dubai marathon in January and I am thinking about going with him to run the 10K. It's the weekend right after the Christmas holiday, but since Karla and I will be staying here, the timing is pretty good. Plus, it's only an hour away and there are several flights a day. It's not likely, but in case I need to come back right away, I will be able to. Last weekend I took the car in to be painted. We've had to beg rides here and there all week. Hopefully it will be done today. We were also headed to get some groceries. We had to stop at the bank to get some cash. I popped in my card and punched all the usual buttons (when you hit "fast cash" in Kuwait, the lowest amount offered to you is worth about $250). Then the machine started beeping at me. "Take your card," it said. But my card hadn't come out. When I peered into the card slot, I could just see the edge of it, but there was no way to get. After a moment the machine sucked it back, the edge disappeared, and tried again, the edge reappeared. It looked like it was getting caught on the plastic trim around the card slot. I thought that if slid a paper business card into the slot, the bank card would slide along the card over the lip of the trim that it was getting caught on. I was all ready when the machine stopped beeping at me the second time. The edge disappeared. I stuck the card in. The screen flashed a message that said since I didn't take my card, it would keep it. Oh, it didn't give me any money either. Karla can't remember the code to her card since we never use them (tutoring money provides all the cash that we need). We pooled all the money we had and did manage to get some groceries. The bank phone line told me that I had to go into the branch when it opened in two days to get my card. But when I went in, they had sent my card to my home branch, which is a long way away from where I live. But in the end, they will send it back to the branch I can walk to. I pick it up today (inshallah). But they were nice enough to give me some money. Oh well, I'd better see to those tests I gave yesterday. Masallama until next week. Posted by Jamie Hide at 11:15 p.m. I got the car washed again yesterday - even though I was taking it to get painted, I went for the wash since they clean the inside as well. The guy started by filling up two four liter bottles and put one at the front and the other behind the car. He wet the car down with his hose. Then, he picks up the bottle at the back, takes a couple steps back, and pours the bottle of soapy water into the jet of water. Instantly, the car was covered in a blizzard of suds. It turned white. He repeated the process from the front before getting out his cloth to scrub it down. It was one of those moments when you take pleasure in the creativity people show in doing ordinary things. Posted by Jamie Hide at 12:32 p.m. It's time for another picture! Karla has been feeling better this week. Her stomach hasn't felt upset for a while and her back is even feeling better. Whether it's that she's getting used to climbing the stairs and being on her feel, or she has time to do a bit more exercise. We even did prenatal yoga together. The adventure in Kuwait this week has been the car registration. All car over three years old need to go in for a safety inspection. The inspection consists of revving your engine - they check for smoke out the tailpipe, and showing your brake and signal lights. I passed all of those, but the car need a new paint job before it can be deemed roadworthy for another year. So today, I have to take the car in to get painted. It's the start of the first long weekend of the year. Last night we went to our usual salsa lesson, which was followed by the rueda, a version of the salsa that is done in a circle. It's a little like square dancing (but not that much!). It was good fun. It uses the moves from salsa, but just modifies them slightly so that at the end of the move you pass your partner off and pick up another. We are thinking about a trip to Egypt in November during our school holiday. 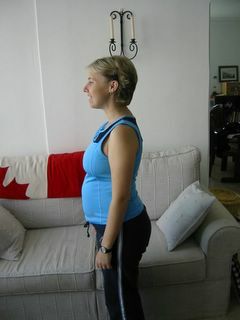 Martine, who we travelled in Oman with, is interested in coming too. Her boyfriend will be too busy to get away. It will be good to have another person along. Martine and I have never been, but Karla spent a week in Egypt when we were in Turkey. She can take it easy, picking and choosing what she wants to see and when she wants to relax. There aren't any tickets available right now, but lots of people book several trips and cancel later. So there's still hope. We don't have to commit right away, so we can see how Karla is feeling later on too. Posted by Jamie Hide at 2:48 p.m. It's Thursday morning again. It's the first real weekend. Last weekend we spent both days at the school getting our classes ready for the beginning of school. Unfortunately, Karla has rejected the idea of a weekly photo. There won't be much difference between them. I think I have got her to accept a photo every second week. Karla has been feeling better lately. She was sick last weekend, but has felt better since then. Work has been tiring. After the first day, she came home and lay down for a nap at 5. I tried to wake her up at 7:30, but she refused and ended up sleeping through until 5 the next morning. There's no tutoring yet, so she's getting her rest. I hope that she will try to find students to tutor who are willing to come to our apartment for their lessons. Unfortunately, since she started work, her back has been sore. But last night, we went to our usual salsa lesson, and she felt better afterwards. I think that a little activity will help her to keep limber. I went for my first hour of tutoring this week with Faisal - my favourite student from last year. His assignment was to practice measuring things for science. So I have a few dimensions to give you an idea of the scale of a Kuwaiti house. His living room is 14.5m by 7.5m. The dining room table is 7.5m long. He was telling me about the new house his family is building, "bigger than this one". The new plan is to have a soccer field, basketball court and tennis court around the house. Then, as the three boys grow up and get married, the sports fields will be taken out and their houses can be put up beside the parents' house. Kuwait is so small that anywhere you might work in the country is close enough to get to. It will be a quiet weekend. We've both got a couple details of the school opening to set up still, but mostly , we'll be just taking it easy after the last two weeks of being pretty constantly busy setting up house and work. Last night we watched Connie and Karla with our friend Jamie from Vancouver. 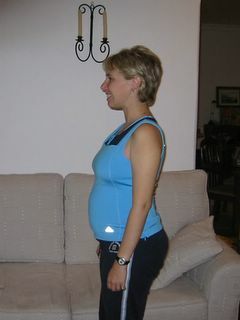 Posted by Jamie Hide at 12:48 a.m.
Karla is doing her Kathy Smith pre-natal exercise video for the first time right now. She is wearing her exercise outfit, which is also her pregnancy development photo uniform. She has just promised to pose for the photo after her workout. Right now, her hair is not up to standard. I think she may have unrealistic expectations about how much the video is going to do for her. Mission accomplished. She had a change of heart and volunteered to have the photo taken before the work out. Here is the beautiful mama-to be. It's our first weekend in Kuwait. We're headed to see the doctor today for a checkup for Karla. Then a little trip into school to get everything ready for the kids who start on Sunday. We'll pick up our plants from their summer babysitter and head off to a little salsa party this evening. Posted by Jamie Hide at 12:09 a.m.